During the past decade, the study of chemical (sonochemistry) and physical (sonophysics) effects of high-intensity ultrasound is a rapidly growing research area. In recent years, much attention has been paid to this area of research at the Institute of Technical Sciences of SASA, too. Our research has shown that high-intensity ultrasound can induce a wide range of chemical and physical consequences beneficial for the synthesis of novel materials or stabilization of nanometer-sized particles. Chemical effects of high-intensity ultrasound fall into three areas: homogenous sonochemistry of liquids, heterogenous sonochemistry of liquid–liquid and liquid–solid systems, and sonocatalysis (which overlaps the first two). The chemical effect of ultrasound arises from acoustic cavitation, that is the formation, growth and implosive collapse of gas bubbles in a liquid. Bubble collapse induced by cavitation produces intense local heating with temperatures up to 5000oC, pressures of about 1000 bar, and heating and cooling rates about 1010 K/s. There are two regions of sonochemical activity. One is the inside of the collapsing bubbles; the other is the interfacial region between the cavitation bubbles and the surrounding solutions. If the reaction takes place inside the collapsing bubbles, spherical or nearly spherical products are obtained as result of an extremely rapid cooling rate which occurs during the collapse. If the reactions take place in the interfacial region, the products of uniform shapes, such as tubes, rods and the like, are obtained. 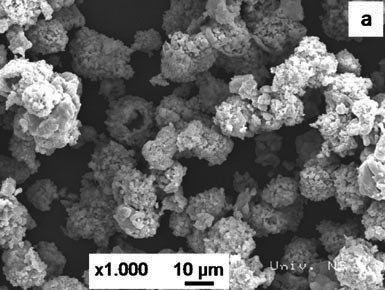 The application of sonochemical reaction with additional thermal treatment made it possible to obtain LiFePO4/C composite within 2.5 h . Furthermore, the main advantage of this method is the formation of an in situ carbon coated LiFePO4 nanostructured powder of high purity, which provides homogeneous material with improved electrical conductivity. On the other hand, uniformly distributed carbon suppressed particle growth during thermal treatment, and consequently derived powder with mean particle size 200-300 nm. Fig.1 shows TEM image of LiFePO4/C. 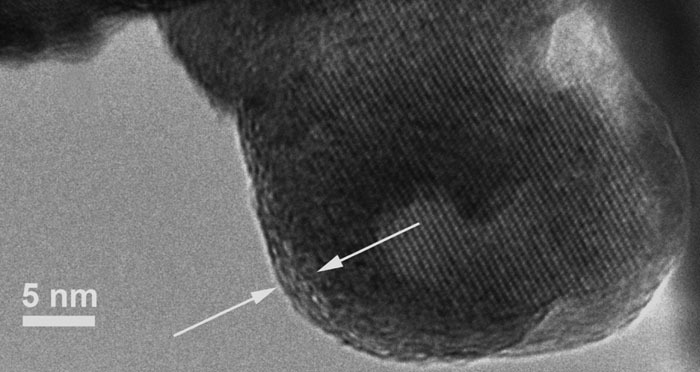 On the thin particle edges carbon film with a typical thickness of several nanometers can be observed. This carbon layer is responsible for improved electrical conductivity, which resulted in good electrochemical performances of synthesized powder. This method may also be suitable for selective doping with supervalent cations to increase the intrinsic electronic conductivity of LiFePO4 powder. (Image:Solid State Ionics, Vol. 179 (2008) 415–419) . Positive influence of ultrasound on the crystallization processes is shown by the dramatic reduction of the induction period, the supersaturation conditions and the metastable zone width. Sonocrystallization exhibits a number of features specific to ultrasound wave that clearly distinguish it from ordinary crystallization. For most materials such features include (a) faster primary nucleation; (b) relatively easy nucleation in materials that are usually difficult to nucleate otherwise; (c) the initiation of secondary nucleation; and (d) the production of smaller, purer crystals that are more uniform in size. During the process of precipitation of hydroxyapatite in sonicated and nonsonicated systems, results showed shortening the time required for monophase HAp synthesis in the field of ultrasound . Consequently, we may conclude that the main differences between the sonochemical and classical homogeneous precipitation methods for monophase HAp preparation are the different morphologies and significantly decreased sizes of the sonochemically obtained crystals. Different morphology of the crystals indicates different mechanism of crystal growth in the field of ultrasound. Physical effects of high-intensity ultrasound, which often have chemical consequence, include enhanced mass transport, emulsification, bulk thermal heating, and a variety of effects on solids. Ultrasonic is apt to break up the agglomerates of particles in the suspension, owing to its shockwave effect, thermal effect, micro-jet effect, acoustic cavitation effect, etc. Precisely, when a cavity collapses near a solid surface, it creates high-speed jets of liquids or shock waves that may induce surface damage and the fragmentation of brittle materials. Furthermore, when shockwaves pass over particle in close proximity to one another, high velocity interparticle collisions can result. However, when cavities collapse violently, they produce intense stress. The induced stress is strong enough to fragment powder agglomerates into smaller aggregates. The fragmentation can occur either by fracture or erosion. Erosion refers to particle size reduction due to the loss of primary particles from the surface of the agglomerate, whereas fracture is the partitioning of the original agglomerate into several smaller agglomerates. Which breakage mechanism will dominate depends on the applied ultrasonic intensity, as well as on material properties. For erosion to take place, the primary particles have to be freed from the surface of the agglomerates. This means that the cavitation pressure must be higher than the cohesive strength with which the surface primary particles are bound together. Fracture results from cracking of the agglomerate compact. Stresses exerted on the agglomerate initiate and propagate cracks from flaws on the surface. Resistance against fracture (agglomerate strength) depends on the size of the surface flaws and the fracture toughness of the particle assembly. De-agglomeration efficiency depends on many factors, such as ultrasonic frequency and power, treatment duration, and liquid characteristics (in particular surface tension, gas solubility, vapor pressure, and viscosity). 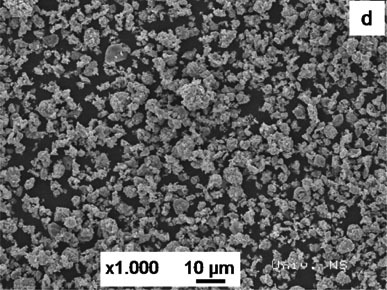 In terms of physical effects of ultrasound, ultrasonic irradiation (ultrasonication) of liquid suspensions of ceramic powders was used for de-agglomeration and dispersion of sub-micro as well as of aggregated-agglomerated nano-sized particles that cause problems in post-processing and degrade product quality. Due to its ferroelectric and dielectric properties barium titanate (BaTiO3, BT) based materials have many applications in electronic devices industry. Moreover, BT-based dielectrics have dominated the multilayer ceramic capacitors industry since 1950s, representing 80-90% of the business. Solid state reaction between BaCO3 and TiO2 is one of the easiest ways for the preparation of barium titanate. In spite of the disadvantages of this method, such as large coarse grains, inhomogeneous mixing or broad particle size distribution, the solid state synthesis provides an economical and widely used method for large-scale fabrication of BT-based powders. Agglomerated powders prepared by solid state reaction are not highly reactive toward sintering, which generally limits the ability to fabricate reliable electronic components. In addition, powders' sinterability can be improved by reducing the particle size and narrowing particle size distribution by mechanical milling. However, during mechanical milling impurities can be introduced into system. We have found that, instead of mechanical milling, ultrasonication is much more effective for de-agglomeration and activation of powders synthesized by solid-state reaction, avoiding thus impurity introduction . 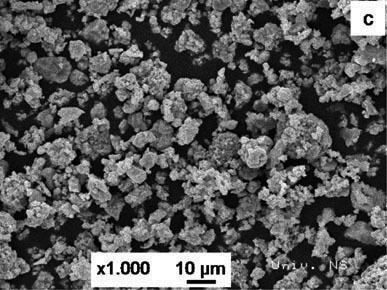 We applied high-intensity ultrasound irradiation for de-agglomeration of micro-sized barium titanate powder synthesized by solid state reaction. 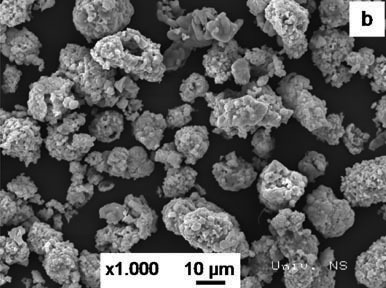 After 3h of ultrasonication, agglomerated powder consisting of 1.4 µm average particles was de-agglomerated to the nano-sized one with average particle size of 64 nm . It was found that the particle size of the BT powder was influenced by ultrasonic treatment, while its tetragonal structure was maintained. Stable crystal structure and constant crystallite size during de-agglomeration indicate that ultrasound irradiation reaches maximally to the boundaries between crystallites. Fig. 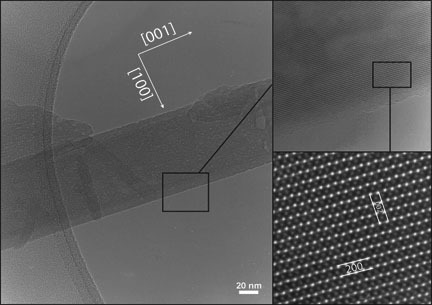 3 shows SEM image of barium titanate powder ultrasonically de-agglomerated during (a) 0 min, (b) 10 min, (c) 1h and (d) 3h. We found that during ultrasonication of BT powder, large hard agglomerates were firstly softened, than fractured into sub-micro particles, and finally, after 3 h of ultrasonication, power was sufficient to break up the weakend Van der Waals forces between the primary particles, and to reduce primary particles to nanometer crystallites. Therefore, high-intensity ultrasonic irradiation can be proposed as an environmentally-friendly, economical, and effective tool for de-agglomeration of barium titanate powders. D. Jugović, M. Mitrić, N. Cvjetićanin, B. Jančar, S. Mentus, and D. Uskoković, "Synthesis and characterization of LiFePO4 /C composite obtained by sonochemical method", Solid State Ionics, Vol. 179 (2008) 415–419 (doi:10.1016/j.ssi.2008.03.014). M. Jevtić, M. Mitrić, S. Škapin, B. Jančar, N. Ignjatović, D. Uskoković, “Crystal structure of hydroxyapatite nano-rods synthesized by sonochemical homogenous precipitation", Crystal Growth and Design (2008) accepted. S. Marković, M. Mitrić, G. Starčević, and D. Uskoković: "Ultrasonic De-agglomeration of Barium Titanate Powder", Ultrasonics Sonochemistry, Vol. 15 (2008) 16-20 (DOI:10.1016/j.ultsonch.2007.07.008).